Twenty-five years ago, Latinos comprised about 8 percent of the U.S population, but only one or two were in top leadership roles at Fortune 500 companies. So a group of forward-thinking Latino leaders, including Jake Alarid from the American GI Forum and Raul Yzaguirre from the National Council of La Raza, decided to start holding corporate America responsible for including Latinos. If companies wanted Latino dollars, they were going to have to start hiring Latinos, promoting them to leadership roles, supporting their businesses and giving back to the community. They formed the Hispanic Association on Corporate Responsibility (HACR) and made it their mission to ensure Latinos are included in corporate America at a level that’s commensurate with our economic contributions. Twenty-five years later, HACR keeps growing. In addition to celebrating its silver anniversary in Washington D.C. last month, the nonprofit broke two organizational records this year: growing to 52 corporate members and raising more than $1 million. The success stems from the visionary insights of HACR’s founders and the contributions of its leaders over the years, said HACR’s President Carlos Orta. They recognized the viability of the Latino community before we became the country’s largest minority group. And they named HACR and pegged its mission on the idea of corporate social responsibility before the term had really taken root in corporate America. HACR achieves its mission by focusing on four aspects of corporate social responsibility: employment, procurement, philanthropy and governance. When a company partners with HACR, it commits to working toward including Latinos in each of those arenas, with HACR leading the way. 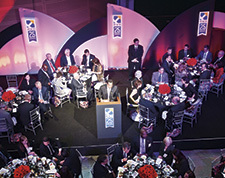 To help chart the course, HACR conducts extensive research for the benefit of its members, including its Corporate Inclusion Index, which measures Latino inclusion in corporate America, and its Corporate Governance study, which counts the number of Fortune 500 board seats occupied by Latinos. To ensure a pool of talent is available for corporations to choose from, HACR’s programs work to identify and train Latino leaders. They include the Young Hispanic Corporate Achievers Program, which recognizes corporate America’s top Latinos between the ages of 25 and 40, and the Executive Education Program with Harvard Business School, which trains Latinos to serve on corporate boards. It’s a powerful combination, said Raymond Arroyo, the chief diversity officer at Aetna. When the health insurance provider joined HACR six years ago, it wasn’t listed in Diversity, Inc’s annual ranking of Top 50 Companies for Diversity. It’s made the list three years in a row now, and ranked 19th this year. Aetna’s partnership with HACR helped make that possible, Arroyo said. “It’s a very powerful and collaborative effort,” he said. Mark Bertolini, Aetna’s CEO, participated in the HACR event. But there’s still more work to do. Looking forward, HACR hopes to grow participation in its annual Corporate Inclusion Index, continue providing a pipeline of Latino talent, increase the number of Latinos on Fortune 500 boards, and see the first Latina Fortune 500 CEO, Orta said.